Dungan, Nicholas. Gallatin: America’s Swiss Founding Father. New York & London: New York University Press, 2010. Gaff, Alan D. Bayonets in the Wilderness: Anthony Wayne’s Legion in the Old Northwest. Norman, OK: University of Oklahoma Press, 2008 . I received an email on Tuesday, September 26th that I had been chosen as one of the eight people to participate in an overnight experience at a representative slave cabin as part of a weekend-long event beginning with a dinner at the Harvey B Gantt Center for African-American Arts & Culture (Charlotte history FYI: Harvey B Gantt was the first African-American mayor of Charlotte). The eight chosen had purchased tickets to attend a dinner at the Gantt Center to hear remarks by Joseph McGill about the Slave Dwelling Project. The Project’s aim is “to identify and assist property owners, government agencies and organizations to preserve extant slave dwellings” with the ultimate goal being 1) preservation of the historic dwellings still in existence and 2) using these dwellings to facilitate education for the modern-day audience about the lives of their inhabitants and of the slave experience in general. We were told to bring sleeping bags (and a pad), a pillow, water, toiletries, a long sleeve, and an “open mind to conversations.” I didn’t know what to expect, but I was eager to take in any insight that I could from the experience. It required a bit of planning as we are a one-car household and I rely on public transportation, but the logistics were worked out so that I was able to begin the experience at the President James K Polk State Historic Site at 4:30 on Friday, September 29th. For those who don’t know, Polk, who was the 11th President of the United States, is one of three* (*Andrew Jackson is counted by both NC and SC) presidents born in North Carolina with all three making their way over to Tennessee to settle at some point in their lives. All three came from rather humble beginnings compared to other presidents of the time, though Polk’s family seems to have been the most well-established upon his birth. We would soon learn that the two cabins present on the site were not original to the site (though they were original to the county; at the time, cabins were torn down when folks decided to move and the materials taken to the next site or used by others in the area to construct new buildings and/or repair existing buildings – waste not, want not!) and the site itself was likely not the location of the original Polk homestead (before they sold it and moved to Tennessee, the Polks had over 450 acres, and the state historic site only has 21). 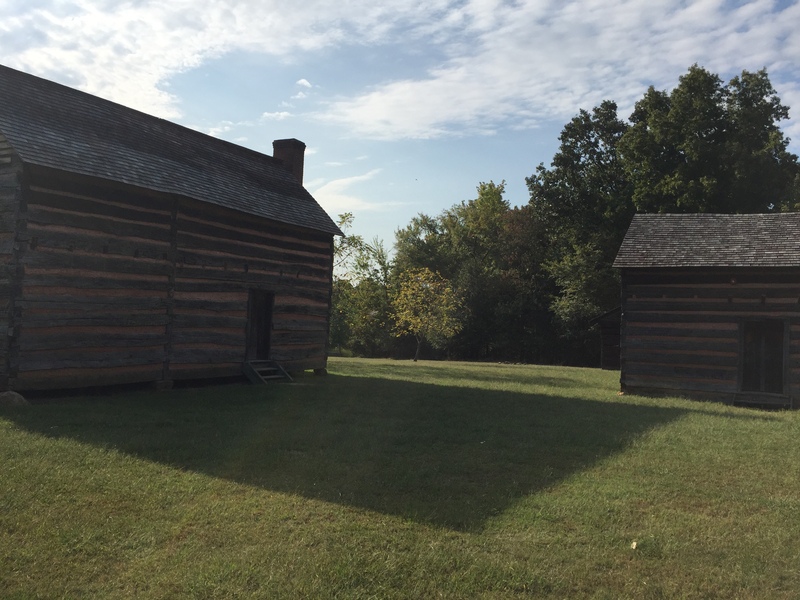 However, the building we would be staying in (the 12 ft by 12 ft kitchen cabin, to the right in the picture above) was the approximate size of a slave dwelling in the area and would be our lodging for the evening. 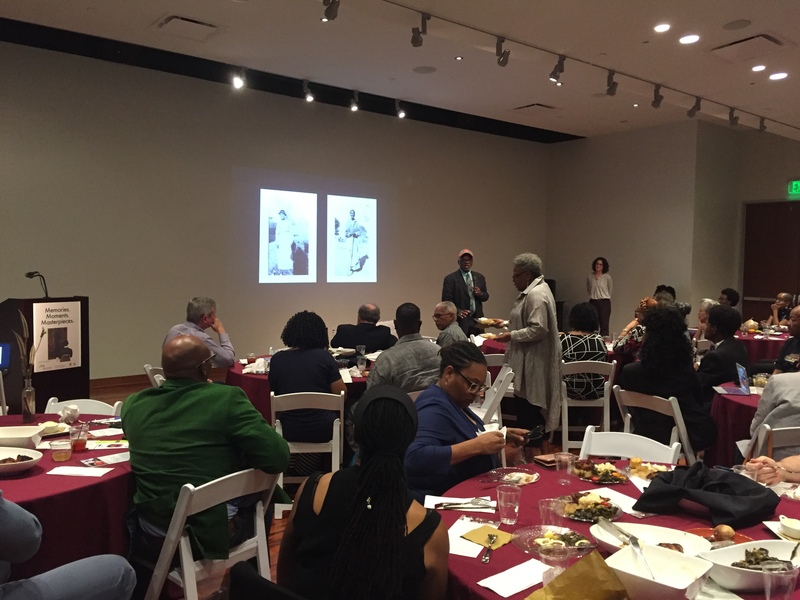 We then ventured to the Gantt Center in Uptown for the dinner where we were able to hear Joe McGill talk about his project and where it’s taken him thus far. There were some surprising locations of slave dwellings that Mr. McGill and the Project have been able to identify. (Side note: The Slave Dwelling Project was originally called the “Slave Cabin Project,” but Joe quickly learned about slave dwellings in urban areas that were a part of the same house that the slave owners inhabited and thus, he changed the name to include any dwelling in which a slave inhabited.) Naturally, there were many southern sites, but there were also sites up the north eastern seaboard. 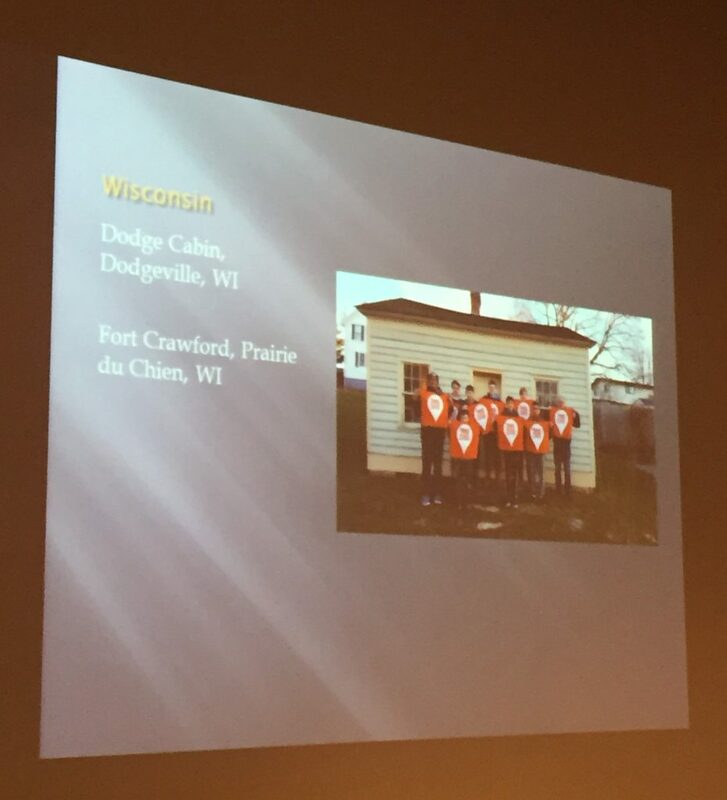 However, the most surprising to everyone was Wisconsin where there are not one but two identified slave dwellings. When the dinner was over, the overnight guests were transported back to the Polk Historic Site where we got our provisions for the evening together, got into more comfortable clothes, and settled in around the campfire once it was going to talk. Putting on my data analyst hat for a moment, the age of the folks around the fire ranged from 13 to 81. The group was predominantly African-American with what seemed by gender expression to be a balance of female to male in the group (though, as preferred pronouns were not asked, I cannot be certain as to the gender identity of the group’s members). The discussion began with Joe asking each of us to talk about why we had agreed to come on the overnight experience. After that, the conversation moved organically. There was very little prompting needed as we all came with that open mind to conversation as we had been asked to bring. We talked about the experiences (what little we know) of the enslaved people who lived on the site: Violet and Luce as well as two male slaves whose names have been lost to history. In addition to those four, a graduate student recently discovered that a fifth slave who had been previously known to Polk scholars was in fact born on the site. The fifth enslaved person, Elias Polk, was James K Polk’s “man-servant” who was, years after the move to Tennessee, brought, along with his wife, by the Polks to serve them at the White House after James was elected president. One of the participants asked about those numbers considering the hundreds of acres that the Polks had prior to moving to Tennessee as it didn’t seem realistic that only four adult enslaved people could work hundreds of acres. A couple of theories were floated about. The Polks could have leased some of the land to other white farmers who, depending on the size of their farm, may or may not have had enslaved people of their own working the land. Also, the historic interpreter for the site shared with me later that it is believed that the Polks had more enslaved people than the five we know of, but because records could have been lost over time or the record keeping just wasn’t that good to begin with, they’ve only been able to prove the existence of these five thus far. We talked a good deal about how difficult it is to piece together the stories of enslaved peoples and, in particular, to get to their stories rather than have their lives filtered through the prejudicial bias of the slave owners. As most enslaved peoples could not read or write (and indeed, were often intentionally kept illiterate by the owners and overseers), while we do have some primary accounts from people like Harriet Jacobs, Solomon Northup, Elizabeth Keckley, and Frederick Douglass to name a few, they represent the stories of people who were able to gain their freedom while the voices of so many more, the lives of people who remained enslaved their entire lives or died while attempting to escape, are lost to us. However, there are a growing number of modern day historians who are examining extant primary documents, historic artifacts, and the archaeological record at historic sites to pull out any details that we can about the lives of the enslaved people who were passed over in the history books for so long and relegated to the background in the narrative of history. On a more personal level, several African-American participants talked about their efforts to trace back their ancestry and, when they got to their enslaved ancestors, they would ultimately hit a wall and could go no further. They might be able to find a name on a ledger, but unless the slave owner was more detailed in recording lineage, they could not tell who this ancestor’s parents were. In many cases, the only thing they knew about this ancestor, the only record of their ever existing at all, was a name that a slave owner wrote in a ledger. A few scripted letters encapsulated a person’s entire life. The discussion also turned to how this legacy, this past, is still affecting the present day. The Civil War, Reconstruction, Jim Crow, the Civil Rights Movement, the Confederate statues, Charlottesville. While there was some acknowledged progress, there was also a shared feeling of frustration. As the night went on, we talked about what could or should be done. As we bundled off to our sleeping bags, we agreed that a greater understanding of the past – the entire past, not just from the perspective of the privileged – was key as was continued conversation. There also seemed to be a shared understanding that we were all in this together and that this was a challenge in our society in which we will either all overcome for success or all fail from not being able to meet it. In the morning, we were asked to share our thoughts through numerous methods – I did write some thoughts as well as answered questions from a local reporter which became part of a story that appeared on the front page the next morning (there is a video as well if you’re interested in hearing the perspectives of a few of the other participants). Since then, I’ve also had a number of friends and associates ask me about my perspective and what I learned. I have also faced criticism about it not being ‘authentic enough’ of an experience and for it being a ‘pseudo-event’. All of this has floated around in my mind the last couple of weeks as I attempted to work on this post while at the same time going back to my day-to-day life. 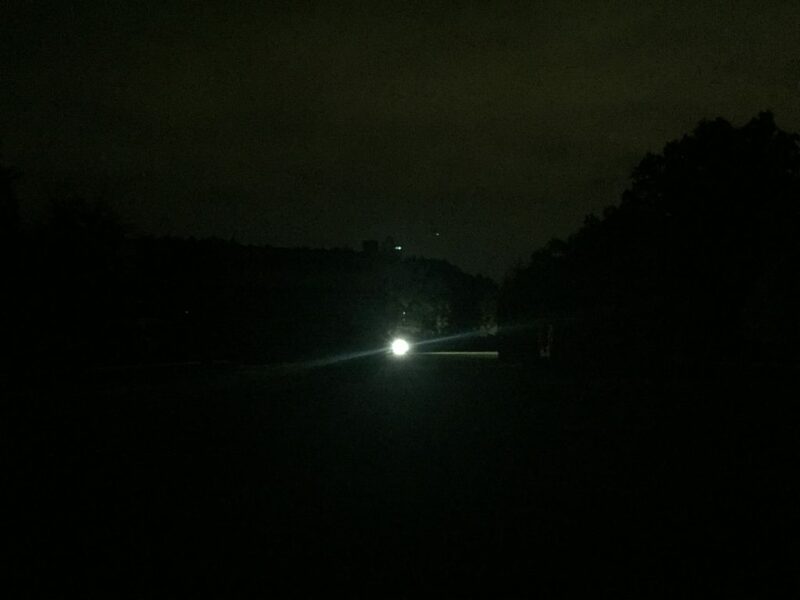 I have reflected on that night while encountering hundreds of people over the last couple of weeks in meetings, presentations, church, the grocery store, on the street, on the bus, in the halls, and at home. For me, it was a reminder of why I do what I do. A few days back, as part of a leadership seminar I’m participating in, I was asked to do a five minute presentation on who I am. I talked a good deal about my love of history and how, at the heart of it, for me, history is all about trying to understand people – both the people of the past as well as those of the present – and how all of our stories come together. While it is so easy for students of history to get focused in on the ‘big names’ – those figures of history for whom there is a wealth of material to study – when I decided to start podcasting, I deliberately started thinking of ways to bring in perspectives and stories that are not as well known and to highlight their role in history as the ‘big names’ couldn’t have been ‘big names’ without many other people. The experience also made me thankful to have had so many insightful conversations over the years with people from diverse backgrounds. I think about the many people that are in my life, and I appreciate just how much I learn from those many folks who have shared their stories and their time with me over the years, be it only a few minutes or if I can count the decades we’ve been in one another’s company. Even when we disagree, I still gain valuable knowledge. I think of all that I have learned and try to incorporate that into my response when I am asked my opinion on a current topic of public discussion or when I am involved in projects focused on inclusion and understanding or when I’m at the ballot box. I think of all of the people I’ve known from many walks of life and of many more that I have not yet met, and I try day by day to work towards a better world for all. I may not always succeed and I may sometimes make mistakes. However, I try, and this experience reaffirmed my commitment to keep on trying each and every day. The only response I have to the criticism I’ve faced is that it is impossible for any of us to fully comprehend any past experience, especially in cases where the perspectives, the voices, of many individuals are lost to us. The history is just that – history. It’s a time that has passed and, even for those events in which we lived, our perceptions of those events are shaped by what we know came after. Events before our lifetimes will forever remain a mystery in some respects. All that we can do in order to try to understand and learn from the events of the past is to read about them in primary and secondary sources, visit historic sites, watch documentaries and extant film footage when possible, participate in or witness reenactments, and use our imaginations to try to fill in any remaining blanks. Our knowledge of history will never be complete, but people like Mr. McGill are trying to bridge that gap because, as much as history is history, it is also present, and in order to understand ourselves, we must try to understand the history that made us who we are today. I commend the efforts of all of those who attempt to do so and would invite the critics to refocus on what’s important: the people. I know that I will never forget that night, sleeping on the wooden floor, surrounded by darkness, and trying to imagine of what the individuals who lived in those spaces would have dreamt. Would sleep have been a relief to them, a few hours of freedom, or would it have been just more time that they felt wasn’t their own? I have no way of ever knowing for certain, but I want to try to understand them and their lives as much as I can as their stories are just as important as those of the people who would have been sleeping in the other cabin and maybe, in understanding the people of the past a little better, we can better understand ourselves and those around us in the present day. Thanks so much to Joe McGill and the folks from the Slave Dwelling Project as well as Scott Warren, Kate Moore, and all the folks at the Polk Historic Site; Bonita Buford and all of the folks at the Gantt Center; and all of the overnight experience participants! It was a pleasure to meet you all and be able to share an evening in your company! All photos not otherwise cited are my own. • Bernhard, Winfred E A. Fisher Ames: Federalist and Statesman 1758-1808. Chapel Hill, NC: University of North Carolina Press, 1965. • Chernow, Ron. Washington: A Life. New York: Penguin Press, 2010. • Doyle, William. The Oxford History of the French Revolution. Oxford: Clarendon Press, 1989. • Dungan, Nicholas. Gallatin: America’s Swiss Founding Father. New York & London: New York University Press, 2010. • Flexner, James Thomas. George Washington: Anguish and Farewell (1793-1799). Boston and Toronto: Little, Brown and Co, 1972 . • Hogeland, William. The Whiskey Rebellion: George Washington, Alexander Hamilton, and the Frontier Rebels Who Challenged America’s Newfound Sovereignty. New York: Scribner, 2006. • Malone, Dumas. Jefferson and the Ordeal of Liberty: Jefferson and His Time, Volume Three. Boston: Little, Brown and Co, 1962. • McDonald, Forrest. The Presidency of George Washington. Lawrence, KS; Manhattan, KS; and Wichita, KS: The University Press of Kansas, 1974 . More information on the French Revolution can be found on Mike Duncan’s Revolutions podcast. Brodsky, Alyn. Benjamin Rush: Patriot and Physician. New York: St. Martin’s Press, 2004. Cappon, Lester J, ed. The Adams-Jefferson Letters: The Complete Correspondence between Thomas Jefferson and Abigail and John Adams. Chapel Hill, NC and London: University of North Carolina Press, 1987 . Curran, Andrew S. The Anatomy of Blackness: Science and Slavery in an Age of Enlightenment. Baltimore, MD: Johns Hopkins University Press, 2011. Golinski, Jan. “Debating the Atmospheric Constitution: Yellow Fever and the American Climate.” Eighteenth-Century Studies. 49:2  149-165. Landry, Jerry. The Presidencies of the United States. 2017. http://presidencies.blubrry.com. 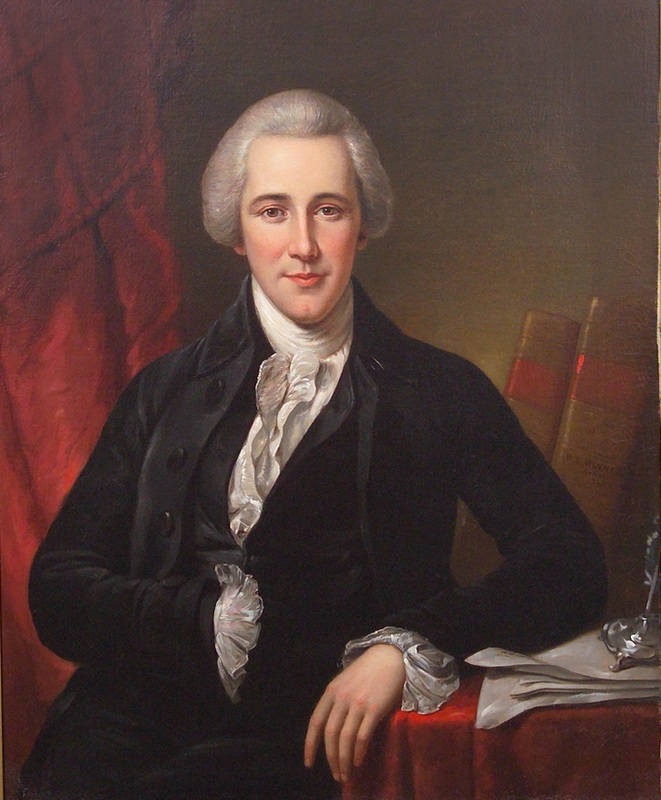 Rogers, George C, Jr. Evolution of a Federalist: William Loughton Smith of Charleston (1758-1812). Columbia, SC: University of South Carolina Press, 1967 . Smith, Mark A. “Andrew Brown’s ‘Earnest Endeavor’: The Federal Gazette’s Role in Philadelphia’s Yellow Fever Epidemic of 1793.” The Pennsylvania Magazine of History and Biography. 120:4 [Oct 1996] 321-342. Stahr, Walter. John Jay. New York: Hambledon & Continuum, 2006 . Stamatov, Peter. “Activist Religion, Empire, and the Emergence of Modern Long-Distance Advocacy Networks.” American Sociological Review. 75:4 (Aug 2010) 607-628. Stephens, Henry Morse. A History of the French Revolution: Volume II. New York: Charles Scribner’s Sons, 1902. Whichard, Willis P. Justice James Iredell. Durham, NC: Carolina Academic Press, 2000.